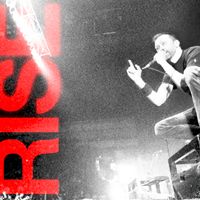 Pre-order the Rise Against 7â now! The self-titled Rise Against 7â is now for sale on marbled red vinyl in the Fat Wreck Chords webstore. We only have 1000 copies available, and they will go fast! This 7â features two unreleased songs from the Appeal To Reason recording sessions (âGrammatizatorâ and âVoice of Dissentâ), and it is not available in digital format. Beginning May 12th, 4000 copies will be available on black vinyl in select record stores.